How old does my child need to be to take cello lessons? More than an ideal age, what is necessary is that the child is both potty trained and familiar with some kind of schooling routine where he/she has learned to follow directions, to work cooperatively and to manage transitions. What size cello do I need? An average 4- to 6-year old child would need a 1/8 size instrument. An average 5- to 7-year old child would need a ¼ size instrument. An average 7- to 11-year old child would need a ½ size instrument. Most 11- to 14-year olds would need a ¾ size instrument. By age 15, most people need a full size instrument. Above all, stay clear of CSOs or "Cello Shaped Objects.” These are underpriced instruments for sale (under $1000), which are a waste of money since a poor quality instrument hinders a student's learning. This is the equivalent to learning to play basketball with a deflated ball! It's better to rent while you take the time to shop around for a decent instrument. 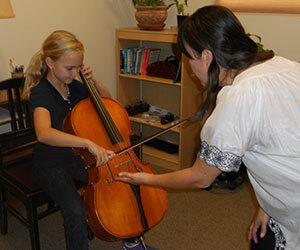 Does a student need any prior musical experience before taking cello lessons? Are there any opportunities for playing chamber music with other students? Yes, our cello teacher will arrange small ensembles with other string players.